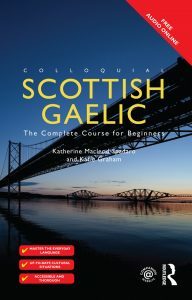 The Library has purchased an e-book version, with an audio file, of Colloquial Scottish Gaelic published in August 2015. The e-book can be accessed via the Library’s DiscoverEd, or click here. Audio material to accompany the course is available to download free in MP3 format from www.routledge.com/cw/colloquials.